One area we’ve been paying particular attention to recently has been the internet traffic for different web site categories. Our friends over at comScore Inc. collect a wealth of information for “measurement of the myriad ways in which the Internet is used and the wide variety of activities that are occurring online.” Nice alliteration, guys. Using some of the data they’ve allowed us to share with you, we had the bright idea to stuff it into our most favoritest charting type, the treemap. And what’s better than a chart? 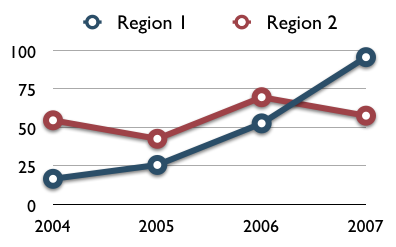 Answer: an interactive chart with a toggle button. The map is based on unique visitors by site for August 2007 and November 2007. Red means a decrease in unique visitors over that three month time period and green means an increase. Black means there is no change. You can click on the category headers to zoom into each category. Click on the category header again to zoom back out. We provide two views of the data: the default shows just the top ten sites in each category. However, for nearly all categories, sites outside the top 10 account for over 50% of the visitation in the category (the exceptions were Search, Portals, and Auctions where the top players dominate traffic). A checkbox adds “All Others” and gives you a better sense of the size of each category. You can toggle these two views using the checkbox just below the map. Due to some confidentiality restrictions that we’re under regarding the raw data, we couldn’t show other metrics that would really make this visualization sing—but I bet if you contacted comScore, they’d be glad to discuss with you. A few tech notes. 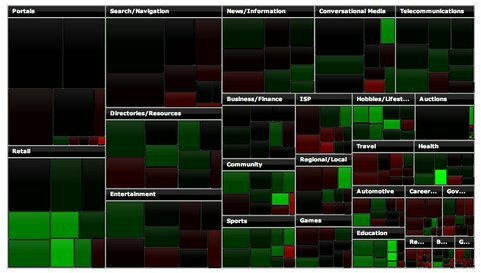 The treemap is adapted from Josh Tynjala’s capable open-source Flex Treemap component. Site images are provided by Amazon.com’s Alexa site thumbnail service. Notice that there was a distinct increase in retail web visitors leading up to the holiday seasons. Not too good of a showing for those online gambling sites; travel either. Sports traffic is up… but not for the MLB.com site. Oh yeah, baseball season is over. Disclosure: comScore is a client of Juice Inc. The New York Times—normally a source of clear and interesting infographics—produced the following graphic over the weekend. The color choices are bad. The saturations between groups are considerably different. The yellow is highly saturated while the other colors are not. 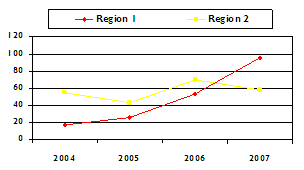 The increased saturation draws your attention to the yellow area, but this is just a category like the others. I’d imagine someone with red-green color blindness would have trouble distinguishing the other colors. There’s a hole in the center. Presumably this indicates people who didn’t respond to the question, but this is not noted. There are no gridlines in the white section even though the non-responding group should be treated visually like the other groups. It’s hard to compare the sizes of groups. People are better at comparing lengths than volumes. Mixing length and volumes—some of the of the response categories are arranged linearly, while the inner category is basically a volume (with a hole! )—makes it nearly impossible for people to use their spacial skills to side up the differences. Asking people to compare lines and donuts is like asking whether you prefer the color blue or raw carrots. For the record, I prefer carrots. 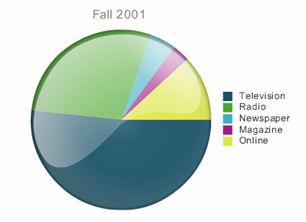 If you’re interested in the concept of square pie charts, the place to start is at EagerEyes. If you want to learn how to make them yourself, check out our contest, results, and screencast. The Times is still a source of great design and inspiration. Here’s another graphic they also produced over the weekend that shows cancer incidence, survival rate, and gender differences in a way that is clear, clean, and concise. The design process is about whittling away distractions, making the obscure feel obvious, making the obvious feel implicit, and doing it without anyone noticing. To the untrained eye, your best work looks like you’ve done no work at all. If you’ve done a stellar job, then your design will feel utterly obvious. —Neil Mix from Paradox of Elegance blog post. Designer Bret Victor, who we first wrote about here, has developed a desktop widget for the SF-area train schedules. He allows users to change their query right in the description of an object—notice the red text. While we are fawning over Bret’s handiwork, here’s another cool feature he built into his Click-Shirt site for customized design of t-shirts. This bar at the bottom of the screen tracks the history of changes as the user designs a shirt. Each time I make an edit, I get a visual breadcrumb trail to easily see my history and backtrack. 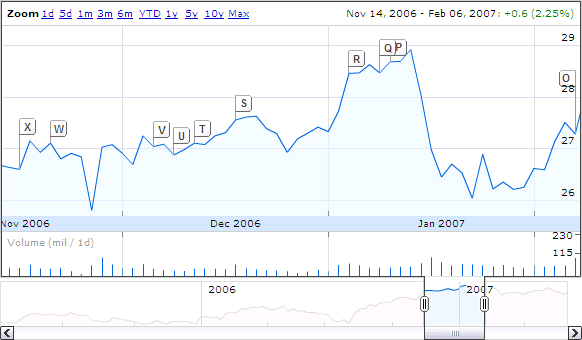 Google Finance stock charts have a nifty little device that lets you change the time range you are looking at. You can change both the size and the start of the time window using one adjustable object. Not to mention the embedded alert markers. Some elegant touches are more subtle. Check out the search toolbar in Firefox. When I start typing, it fills out search terms both from my history (above the line) and from common searches (below the line). The Safari browser for Windows offers a new approach for finding words in a web page. The browser greys the screen and highlights the target word. And you can to tab through the various instances of the word with the orange highlighting. Finally an infographic from the New York Times called the Sector Snapshot. The beauty of this presentation of information is in the careful use of contrast and skill at keeping the focus on the numbers. 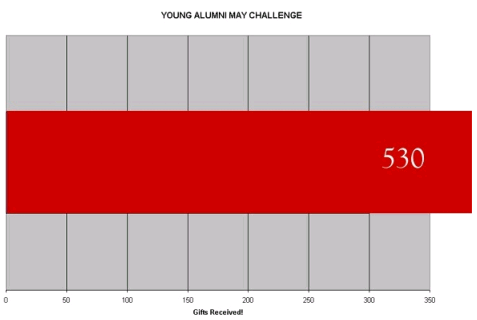 Aside from the crazy looking gridlines, monsterous size, oddly phrased title, and overkill for a single data point, its greatest sin is not giving the Young Alumni enough credit. They blew away their goal of 300 gifts, you just wouldn’t know it from this chart. Everyone wants a dashboard and the promise of a world in which the intricacies of your business are clearly laid out on a single page. Dashboards can make running your business as easy as driving a car, where slight adjustments and careful attention to warnings mean smooth sailing on the road to success. I’m not so convinced. For someone who is, check out the mysterious Dashboard Spy. He/she has a massive collection of dashboard screenshots and describes these precious morsels as "simple to understand and impressive to look at, these scorecards are becoming ’must-haves’ for all enterprises." If we already live in a dashboard-centric world, we might as well do them right. I see at least three areas where dashboards need improvement: depth, information display, and storytelling. A faceted analytical display is a set of interactive charts (primarily graphs and tables) that simultaneously reside on a single screen, each of which presents a somewhat different view of a common dataset, and is used to analyze that information. 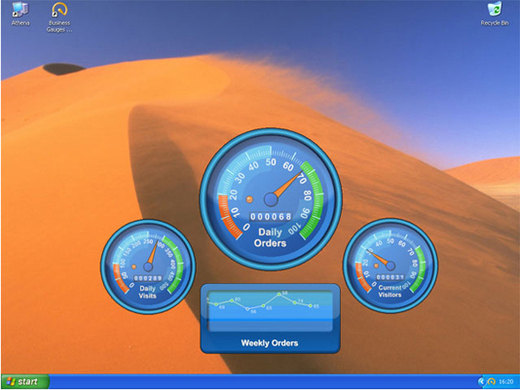 We might consider dashboards a static version of FADs (or we could consider FADs a versatile dashboard). If that’s true (and I’m sure Stephen will step in to correct me), then who wants a plain dashboard? Why build something that only raises questions but doesn’t give the user any ability to drill down, explore, tweak parameters, or otherwise try to answer those questions? Just because you can make it shiny doesn’t mean you should. Crystal Xcelsius not only vigorously embraces pie charts, but they add a "reflective kidney bean" to further derail the information display. Storytelling. Most dashboards are loose affiliations of charts—a hodgepodge of graphics on the same topic intended to offer a full view of a situation. It is the same problem so many people run into in creating PowerPoint presentations. Set the stage. What is the context? Who are the characters? Focus on only the important elements and themes; don’t try to be a comprehensive account of everything that happened. Ruthlessly cut extraneous content. Offer recognizable characters to spare the reader’s precious attention. There is a high cost to asking readers to learn from scratch. For dashboards this means terms, metrics, graphics, and metaphors that are familiar within the organization. Create flow and cohesiveness from chapter to chapter. Themes and characters reappear chapter after chapter. A good dashboard isn’t a bunch of disjointed charts, but a logical flow from one analytical examination to the next. Levels of detail. Some elements of the story span the entire experience; other details provide the insights and seasoning to keep your interest. Here’s a good example of a dashboard (perhaps FAD) from Visual I-O that has many of these storytelling elements. If you’ve seen a worse dashboard, sent it our way and we’ll put together a gallery of the worst of the worst. Please redact any company-specific information. Last week I challenged the you to reproduce this alternative to pie charts in Excel. I promised a screencast to show how it’s done. Eighteen people answered the call with nearly three dozen different solutions. Click here to watch the screencast showing how to accomplish the two most popular solutions; filling cells with conditional formatting and pushing the column chart to extremes. If you want to look at the source,Clint Ivy produced an excellent version of the cell filling approach. Dermot Balson submitted an terrific version of the column chart approach. Thank you to everyone who submitted a solution.